We prepared this unique itinerary for travelers who are interested in a truly Japanese experience: Sushi making. Learn how to make Sushi from a professional Sushi chef who explains everything in English. From the experienced chef, you will learn secret skills and recipes which you will never be able to find in a cooking book! Wear a traditional apron and start making “Nigiri Sushi” and “Maki Sushi”. Get a taste of your own-made sushi accompanied by a beef hot-pot. We are sure this itinerary will be a memorable Japanese experience you will never forget! Please come to the Sushi Shop in the Roppongi area by yourself. The venue will be within walking distance from Roppongi Station (the details of the Sushi shop will be announced in advance). This activity is an independent tour, so no staff will accompany you. The meeting time is 11:50 and you will finish around 14:00. The Sushi Shop will provide a Japanese apron, so you do not have to bring any special items for this lesson. The chef will give you a lecture in English so do not miss this chance to ask any questions on the secrets of how to make sushi. 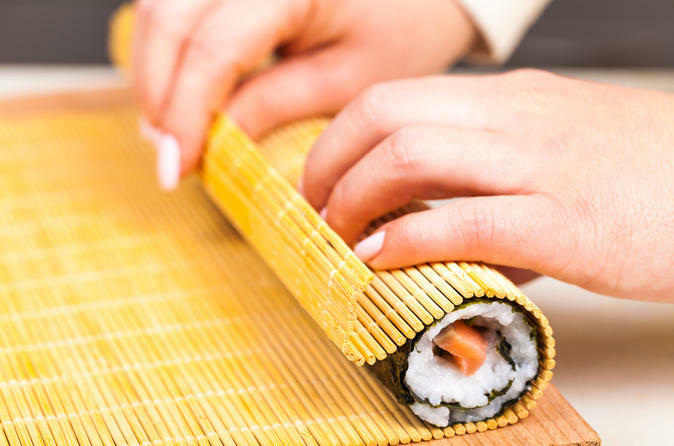 You will learn “Nigiri” (shaped by hands) and “Maki” (rolled sushi) and it will be your lunch. Enjoy your self-made sushi with a beef hot pot. If you are interested in having a real experience of Japanese culture, we believe this activity will be perfect for you. Get the special skills and recipes so you can recreate the experience at home! *You will share this lesson with other participants.